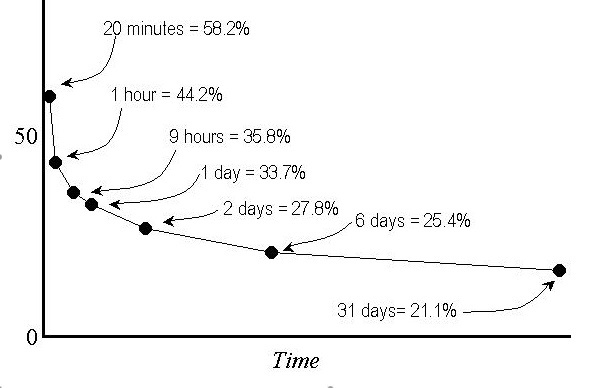 This is the classic ‘forgetting curve’ by Ebbinghaus, a fundamental truth in memory theory, totally ignored by most educators and trainers. Most fixed ’courses’ or ‘lectures’ take no notice of the phenomenon, condemning much of their effort to the world of lost memories. Most educational and training pedagogies are hopelessly inefficient because they fail to recognise this basic truth. Smart learners get it. They revise over a period, with regular doses to consolidate their memories. The real solution, to this massive problem of forgetfulness, is spaced practice, little and often, the regular rehearsal and practice of the knowledge/skill over a period of time to elaborate and allow deep processing to fix long-term memories. If we get this right, increases on the productivity of learning can be enormous. We are not talking small increase in knowledge and retention but increases of 200-700%. It has the potential to radically alter the attainment levels in schools, colleges, universities and organisations. OK, that’s the theory, what about the practice? What strategies enable spaced practice? I’ll start with a few ‘learner’ tips, then a few ‘teacher/trainer’ practices and end on some technical techniques. 1. Self- rehearsal – This is very powerful, but needs self-discipline. You sit quietly, and recall the learning on a regular, spaced practice basis. The hour/day/week/month model is one, but a more regular pattern of reinforcement will be more successful. Research suggests that the spacing different for individuals and that it is good to rehearse when you have a quiet moment and feel you are in the mood to reflect. Recent research has shown that rehearsal just prior to sleep is a powerful technique. Another bizarre, but effective, model is to place the textbook/notes in your toilet. It’s something you do daily, and offers the perfect opportunity for repeated practice! 2. Take notes – write up your learning experience, in your own words, diagrams, analogies. This can result in dramatic increases in learning (20-30%). Then re-read a few times afterwards or type up as a more coherent piece. It is important to summarise and re-read your notes as soon as possible after the learning experience. 3. Blogging – if the learner blogs his/her learning experience after the course, then responds to the tutors’, and others’ comments for a few weeks afterwards, we have repeated consolidation, and the content has a much higher chance of being retained. 4. Repetition – within the course, but also at the start of every subsequent period, lesson or lecture, repeat (not in parrot fashion) the ground that was covered previously. Take five or ten minutes at the start to ask key questions about the previous content. 5. Delayed assessment – give learners exercises to do after the course and explain that you will assess them a few weeks, months after the course has finished. This prevents reliance on short-term memory and gives them a chance to consolidate their knowledge/skills. 6. Record – it is education and training’ great act of stupidity, not to record talks, lectures and presentations. They give the learner subsequent access to the content and therefore spaced practice. 7. Games pedagogy – Games have powerful pedagogies. They have to as they are hard. It works through repeated attempts and failure. You only progress as your acquired competence allows. Most games involve huge amounts of repetition and failure with levels of attainment that take days, weeks and months to complete. 8. Spaced e-learning – schedule a pattern in your online learning, so that learners do less in one sitting and spread their learning over a longer period of time, with shorter episodes. Free your learners from the tyranny of time and location, allowing them to do little and often. In education this is homework and assignments, in training subsequent talks that need to be emailed back to the trainer/tutor. 9. Mobile technology – the drip feed of assessment over a number of weeks after the course or redesign the whole course as a drip-feed experience. We have the ideal device in our pockets – mobiles. They’re powerful, portable and personal. Push out small chunks or banks of questions, structured so that repetition and consolidation happens. This usually involves the repeated testing of the individual until you feel that the learning has succeeded. 10. Less long holidays – it terms of public policy, increasing school results would be betters served by avoiding the long summer holiday and restructuring the school, college and University years around more regular terms and less long vacations. The retention benefit works like compound interest as you’re building on previous learning, deepening the processing and consolidating long-term memory. It is, in my opinion, the single most effective strategic change we could make to our learning interventions. As a cognitive psychologist, I can't agree with you enough here. Repetition, repetition, repetition. I think there's a fundamental conflict of interest inherent in having shorter university holidays and also expecting staff to be able to take leave and get research done, but maybe that's a debate for another day. Item 3 is Blogging surely? Not Bogging? Is this a Freudian slip? Seriously? You're kidding, right Donald? You just wanted to see if the learning community would swallow any old crap and then you're going to lampoon the sorry state of edubloggers. Forgetting curve - absolutely right in the context of formal learning. Rehearsal and levels of processing models of transfer to long-terms memory - complete bunkum and you should know better. First off - rehearsal. I sang the same hymns every morning at school (talk about little and often) - can't remember one of them. The whole notion that you transfer stuff into long-term memory by verbal rehearsal is completely ridiculous: I only have to see some things once and I remember them forever. What if you are unable to speak - are you therefore unable to remember anything? Levels of Processing was a little better - but didn't really get at the core mechanism. Superficially the deeper you process stuff (the more you think about it) the better you remember, but why is not explained by the model. Maybe its just because effort pays off. For sure the levels are wrong (visual, acoustic, semantic) since some things that I only glimpse I remember forever. It's an approximation to the Affective Context Model: if we attach affective context to information (whatever the 'level') then it is more likely to be remembered. So for the specifics: students don't rehearse content at set intervals. If they did, it wouldn't make much difference. They try to revise when they are getting anxious. That way the data has affective context. Successful students are the ones who get anxious way in advance (or even in the classroom) - or who care - and then spend more effort over a longer period making the information stick. True, there is research that backs up rehearsal - but if you aren't making sense of what you rehearse then it's pretty pointless (I have to punch in my Train ID number every week but still can't remember it). As for recording/taking notes - it would work better if students wrote down what they felt: what they disagreed with, what they loved. Intuitively good teachers know this - that's why they involve the class in debates. Some of the other suggestions are effective but only because they force people to attach meaning and affective context to things. I actually care passionately about learning, which is why I remember this type of stuff - whether I blog or not. Using it every day helps too - because it becomes part of my sense of self. We talk about the success of games and forget how many games fail. The ones that work, work because they grip us viscerally - the challenge, the action - but I should point out that many games flop, just as many learning interventions fail. In summary, it's a sorry state of affairs when a learning industry in 2010 is relying on dodgy theorising from the 1970s in order to get things right. This stuff belongs in the bucket with Kolb, Learning styles and NLP. I'm visiting your blog for the first time and want to thank you for your post. You are right, and it is amazing that this "fundamental truth in memory theory" is "totally ignored by most educators and trainers." It's so ironic that educators fail to learn and apply the "forgetting curve" principle, which is as proven empirically as it is entirely intuitive. The basic learning techniques you outline are simple and effective and apparently, extremely difficult for people to accept. Little by little, I suppose. In the meantime, my students will benefit from your advice. Thank you. I found this site from a Tweet by Jane Hart today. I am 110% in agreement with your 10 techniques, and find that I have been using most of them in my class for several years now, without ever haven taken the time to reflect on exactly what I was doing and how it was working. That changes as of now; and I will begin to spread the gospel amongst my associates. Thank you so much! Great post. I agree completely with the problems of how current instructional design is structured in LMSs. Spaced learning, reflecting, etc are excellent techniques for improving retention and recall. I blogged recently about how memory works, the role of the prefrotal cortex and hippocampus and how we can leverage web 2.0 technology to help improve retention and recall. Donald, totally agree as you know. Retention is a neglected area and something I have been pursuing for many years. Here are my posts on the matter that date back to 2006, when I put forward the concept of "Less Learning More Often" while in the US. Thank you, this article will help with my son.He had a stroke and to get the School to help has not been easy due to a stroke is not one of their lables.Again thanks for the info. I'm committed to doing that very list, but execute imperfectly, I fear. The technologies help, by extending experiences, messages and expectations for practice over time and place. Hope you get many eyeballs. Could there be a point no. 11 like a 'use it or lose it' comment? (or would it be part of the other 10 points? If the content is given alongside a course long project or assignment, then the content can be used, evaluated and applied in the project. It could also give meaning to remembering the content, and therefore help decrease retention loss??? Great post Donald. Absolutely correct that if we focused half as much on ways to help learners retain information as we do on creating the content, we'd be farther ahead. What a wonderful and useful post, Donald. I agree that the significance (and implementation) of retention strategies is WAY underrated. However, I don't share your opinion that retention is the "single most effective strategic change we could make to our learning interventions." For me, the #1 lever to push would be relevance. And in many ways, increasing the relevance reduces *some* of the need for retention strategies. As Roger Shank puts it, "The brain tends to remember that which it feels." Because so much of what passes for "learning content" today exists in non-emotional, non-meaningful contexts, we have no choice but to increase the *other* mechanisms for retention. I do believe that without retention, much of what we do is pointless; I'm just saying I think the key place to help push retention is at an earlier point. That said, if we're not able to make those changes (or for things that simply MUST be memorized and that don't implicitly live in a personally useful context (like, say, multiplication tables or programming or some programming language syntax), then yes -- retention strategies would be the best place to focus, and you've done a wonderful job with this list. Thanks for the inspiration... I've been in corporate training and consulting for 30 years and have recently turned my attention to the pre-college years. I will follow up with a blog on increasing retention in the classroom. Good stuff! Thanks! 1. RELAX! A few lectures a week and they need 15/16 weeks to relax? 2. A more evenly spaced calendar wouldn't necessarily result in less time to work, just a more psychology of learning friendly calendar. In addition it gives the increased capacity to take in more students, reducing the low occupancy rates of the buildings. Donald: "1. RELAX! A few lectures a week and they need 15/16 weeks to relax?" Sorry Donald, you've just lost me now. This is a ridiculous and flippant statement. I suspect the previous commentator probably meant to indicate that summers are used on course preparation, admin and research. I know mine are. 15 week holiday? As if. "Relax" in a relative sense only. I think it is less about mindless repeating of information - repartition, repartition, repartition of information/content (although there is something to be said about it)and more about repartition of the concepts in different contexts. I would be interested to hear your thoughts on how connectivist, constructivist theories and what role making meaning from the information you are learning and making connections to current knowledge base plays when using these tips. Also what are your thoughts of the old school behaviorist theories of learning - which included repartition? Why I'm bored with F2F apologists! Salon debate: What are Universities for?